Every day new Tripawd pawrents join us to gather information and consolation from other three legged dog families. Earlier this year, one new member, Athena, came to us to share her story. Coincidentally, she also happened to live in the same area that we do, Fort Collins Colorado. Fort Collins is home to Colorado State University’s Animal Cancer Center, one of the best (if not the best) canine cancer care clinics and research facilities in the world. Earlier this year, Athena was given the devastating diagnosis of osteosarcoma. Luckily though, she lives just a few blocks from the Animal Cancer Center. We recently caught up with Athena and her Mom, Esther, and learned about the allopathic and holistic treatments she is receiving, including Reiki therapy. Athena’s primary care vet is one of the leading animal pain management specialists in the world, Dr. Robin Downing, in Windsor, Colorado. 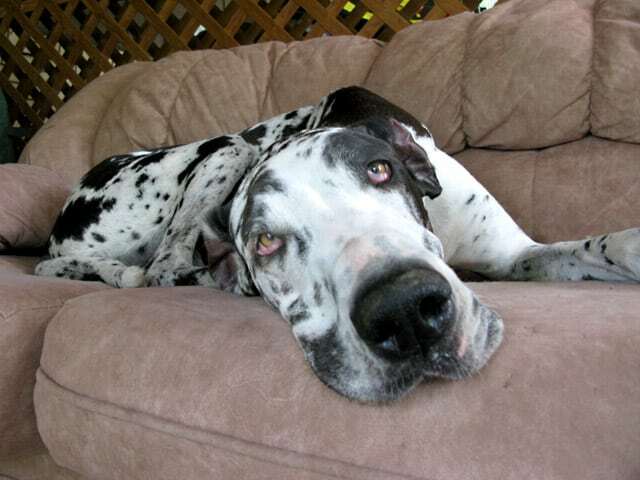 This lucky Dane is also fortunate enough to participate in CSU’s Gene Therapy Clinical Trial (gene therapy uses specific genes that are carried into cells to fight cancer). As you will see in the video, neither amputation nor cancer will stop this giant breed three legged girldog from enjoying life. Athena is larger than life, and absolute proof that even big dogs can make great Tripawds! What a cool story….Athena is a beautiful girl! She seems to be doing wonderful post-op, playful and her mood is wonderful. Great video…thanks for sharing and do good Athena! !